New VP of Procurement at Ford Says Some Models at Yellow Level of Supplier Stress; How Many Companies Can Really Track that Today? A big book of business is almost always a good thing, but often results on the need for procurement to ride suppliers hard to get needed parts, materials and components on time to meet production needs. 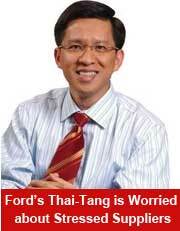 One Ford model line has a "yellow" rating, indicating that too many suppliers are operating at full tilt, Thai-Tang said. At such times, the focus is naturally is on working with suppliers to understand their capabilities to meet a company’s requirements, expediting deliveries as necessary to keep production lines moving, and other steps to help ensure supply can fill demand. But do procurement managers in those situations sometimes lose sight of the quality implications? The quality dimension is something that must receive focus as well, says Hau Thai-Tang, Ford’s recent new group vice president, global purchasing, in an interview with the media this week in Detroit. Thai-Tang moved into the position in early August. He has been at Ford since 1988. According to Reuters, Thai-Tang said the supplier quality issue is a worry right now in the auto industry, where strong consumer demand has kept auto factories humming at many OEMs. "Everyone is running flat out and it's contributing to some of the quality challenges that we've seen," said Thai-Tang, who oversees Ford's $100 billion global procurement budget that includes both direct and indirect goods and materials as well as services. The problem: To meet increased demand, suppliers have less time to do preventative maintenance on their equipment, and normal quality process may be slightly shortchanged as manufacturing runs full bore to meet OEM demand for parts and components. "In the past, when we weren't running at full capacity, when we weren't running at three shifts, when we weren't running seven days a week -- you actually had more cushion," Thai-Tang added. Now, however, he said that cushion is largely gone, and any hiccups in production become lost sales because there is not any time to recover. Noted SCDigest editor Dan Gilmore: "I wonder how many companies even understand true supplier capacities, and how they respond when demand surges. Especially when parts are coming from offshore - are those suppliers throwing more and more labor at it? Are the new, perhaps temporary workers well trained? Are they outsourcing to another firm? These are the kinds of questions companies need to ask and know the answers to in advance relative to their supply base." Thai-Tang also noted that Ford is going to continue to trim the number of suppliers it works with, down to about 750 from 1300 currently over the next few years. This of course is likely to lead to supplier consolidation, as vendors that might get left behind are acquired by larger firms. What percent of manufacturers do you think can well track supplier volume stress levels? Do suppliers and OEMs sometimes skimp a bit on quality when volumes are soaring? Let us know your thoughts at the Feedback button (email) or section below.